- Although THIS little fellow is perhaps targeted towards Valentine's Day, I don't see why he/she wouldn't be cute any time. Perhaps could be made using different weights of yarn too? - THIS is a really pretty pattern for a cowl/hood. And THIS is another one. - For the quilters - there's a free year-long challenge running HERE. This is from last year but the patterns appear to be still available. It's an interesting read too - she gives the history of the block patterns as well. 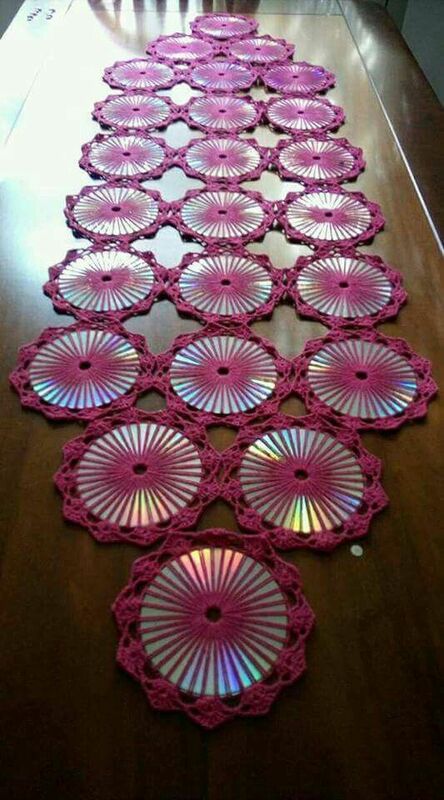 - I am unable to track down the originator of THIS - but what a beautiful way to use your doily collection! (If anyone knows who made this, please let me know and I'll gladly give appropriate credit!). Another anonymous quote..."The things you take for granted someone else is praying for"
Is it going to turn out - or is it the beginning of the end?? - THIS falls under the category of 'wow' - you might have to hit the translate button to read the text though. And while we're on the subject, have a look at THIS art installation!!! We mustn't leave out the coffee drinkers who might like to see THIS. - For those who like miniatures, how about THIS? - There's an interesting article/tutorial HERE about ways to carry yarn up the side of your knitting. - Mary Corbet has a sweet little stem stitch rose tutorial HERE. Another anonymous quote..."Be strong enough to stand alone, smart enough to know when you need help, and brave enough to ask for it"
I suppose I shouldn't tell you that I have all of these done for my Christmas box for next year....that wouldn't be nice would it? Methinks I can feel the hatred for starting so soon flowing in my direction already! So....I won't tell you that they're for Christmas and just tell you that I finished a whole funch (hah - I was going to type 'bunch' and it came out 'funch'....just as my brain was wondering what you would call a whole lot of mittens. Funch it is!). Wonder if I should submit my new word to Funk & Wagnall's?? - If you have some pretty hankies in your collection, perhaps making THESE might be a way to show them off? - I know lots of people like owls and THESE are pretty cute. - There has been a resurgence of interest in making the bulky knit sweaters and there's a nice free pattern available (various sizes) HERE. - Most of you know that I love denim (even though I can't work with it any more), so of course the work of THIS artist caught my eye. Have a look through his gallery! - If you have children in your life who collect stuffed toys, perhaps making them one of THESE would be a great storage solution. - THIS bag is a great way to use up yarn scraps! - If you have a cat (or a kitten) in your life, maybe using up some scrap yarn to make a fun toy from THIS pattern might be fun. - There are lots of free videos HERE that quilters might find of interest. Another quote from an anonymous source..."Friendship isn't about who you've known the longest, it's about who walked in to your life, said "I'm here for you", and proved it"
It was only my second attempt at this art form and I was surprised when my friend wanted to take it, along with the other one I just finished, to the local quilt guild meeting to show the members. She was hopeful that someone might want to commission me to make more. She wondered if I would like to set a price on this one (the other one is spoken for) and I gave her a number that I thought was quite steep. Well, right now I'm bouncing off the walls because it SOLD!!!! Even more exciting is that the guild itself is buying it and will be using it as one of their raffle prizes at their next quilt show being held in 2019. I am blown away and still can't quite believe it!! And, just to prove that something else is happening here at Chez Magpie....the pile of mittens is growing! The pair on the left is for a man and the rest are all for women. I still have to add the buttons for additional pizzaz on each one. - There are lots of free quilt block patterns HERE. (and if you click on the 'Next' button on the lower left you will be taken to a lot more!! - I'm not a painter, but for those of you who are, perhaps you would find THIS interesting. - If you decorate for Easter, perhaps you might like to have one of THESE fellows greeting people on your porch! - And, rather than chocolate, how about making some of THESE for your little ones? - Or maybe make one of THESE? - If you want a yarn bowl and are put off by the price, maybe a trip to the thrift store might yield the makings for THIS (you wouldn't have to paint it either!). And HERE is another idea and HERE is another (the lid would be perfect to keep the dust off too!). The quote today is from Albert Einstein..."The one who follows the crowd will usually go no further than the crowd. Those who walk alone are likely to find themselves in places no one has ever been before"
Men's on the left and a women's pair on the right. They're made from recycled sweaters and lined with recycled velour housecoats. Really fun to make and cheap too! They will be going in the Christmas box for next year (at least 14 pairs!!). Will show you a picture once I have them all finished. The pattern is from HERE (with some adjustments by me). - For those of you who make (or who are interested in making) twiddlemuffs for patients with Alzheimer's or dementia, there is a very good how to (with great ideas) HERE (it's a PDF). They are a wonderful use for scrap yarn. - You know how sometimes you come across something that's so darned simple that you wonder why you haven't thought of it? Well, have a look at THIS video and you'll see two fabulous (and easy!!!) tricks for knitting. - THIS is a fun crochet pattern that would be lovely in baby blankets. - I don't know who created THIS (if you do, please let me know and I'll give proper credit) but I thought it was such a great use for those CD's we hate to throw away. Would be nice to fine the actual pattern. - Awhile ago the San Francisco School of Needlework and Design announced a challenge for participants to create pieces of needlework with the theme 'The Summer of Love'. Their online exhibition of the creations can be found HERE. Their next stitch at home challenge is "View From My Window' and further information can be found HERE. - THIS is a very elegant little pouch that would make a lovely gift for someone. - Am I the only one that remembers at least one of THESE pillows sitting on my grandmothers couch? Today the quote is from Abraham Maslow...."In any given moment we have two options: To step forward into growth or to step back into safety"
My buttons are guarded by 'Elyron' my sewing room dragon, who oversees all that I do. The shelf they're on runs almost the entire length of one wall of my room. I received this wonderful hand-made magpie for Christmas and needed a place to put him/her. Getting rid of four of my button jars gave me just enough space to display my magpie. A win/win! - If you know someone who is expecting a wee one, perhaps she might like one of THESE. - THESE are rather cute to make for your Valentine. - The embroidery pieces shown HERE are quite interesting (be sure to scroll down). THESE aren't embroidered, but certainly fun. - THIS is beautiful embroidery! Another quote from an anonymous source.."Too often we underestimate the power of a touch, a smile, a kind word, a listening ear, an honest compliment, or the smallest act of caring, all of which have the potential to turn a life around"
I'm a day late in posting this AND (maybe worse!) I don't have any pictures for you. You DON'T want to see my cleaning/purging efforts in my sewing room which is what's been happening behind the scenes here at Chez Magpie. Many of you will remember my true confession earlier of having FAR to many buttons for any person in this world. Fourteen (large!) jars AND a nearly full shoe box (see what I mean? Too many!). So....I've been spending my evenings sorting through them and....drumroll.....I am now down to *only* 10 jars! 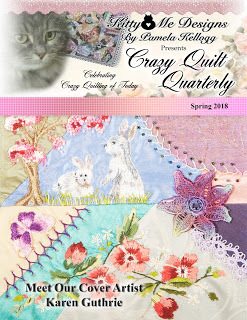 I'm happy to announce that the spring issue of 'Crazy Quilt Quarterly' magazine is now available! There are some wonderful articles, how to's and eye candy in this issue and you can get your own by going HERE (or you can click on the picture of the current issue in my sidebar!). Please remember that we are constantly searching for content for the magazine and welcome YOUR contributions! We are looking for how to articles, photos of your work, and any crazy quilting tips you want to share. You can go HERE for further guidelines. The magazine is entirely reader-written so please don't be shy! - If you are a football fan and are having people over to watch the big game, perhaps you might like to serve THIS. Or maybe THESE? Or THIS? - Seeing THIS made the wheels start to turn. Wouldn't it be fun to create a page like this; make copies (perhaps one for each month) and then write the names of the books you read in the 'spines'? At the end of the year you'd have a fun record of all you read. Hmmmm......??? - THESE would be cute to make for Easter. 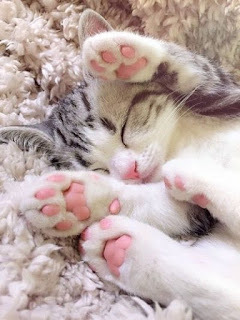 - and THESE are cute too! - If you'd like to make a wee teddy bear, how about THIS one? And HERE is a pdf for a simple bear. This is another quote from an anonymous source..."The quieter you become, the more you can hear"